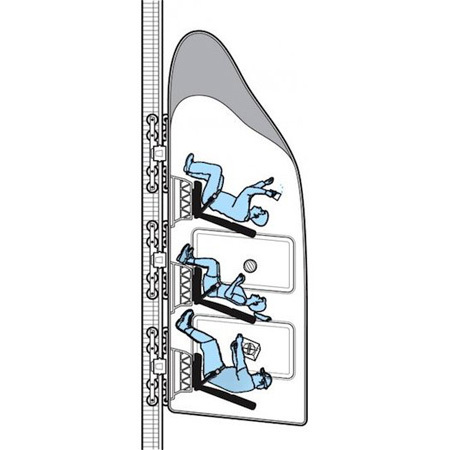 The NASA-inspired “Zero Gravity Roller Coaster” will cost approximately $50-million to build and “travel up a steep track at speeds of 100 miles an hour before beginning a controlled drop that would essentially put its passengers into zero gravity for eight seconds.” Continue reading to see how passengers would look inside the ride. To create that illusion, a linear induction motor system would speed coasters up the track with unprecedented precision. As the coaster approached a top speed of more than 100 mph, it would suddenly and ever so slightly decelerate – just enough to throw the passengers up from their seats, like stones from a catapult – and then quickly adjust its speed to fly in formation with and around the passengers.